Sepsis, the host's reaction to infection, characteristically includes multi-organ dysfunction. Brain dysfunction is often one of the first clinical symptoms in sepsis and may manifest as sepsis-associated delirium in up to 70% of patients [1, 2], less often as focal deficits or seizures . As severely reduced global perfusion leading to hypo-tension, maldistribution of regional blood flow, and tissue hypoperfusion is a key feature of severe sepsis and septic shock, the question whether there is a link between cerebral perfusion and brain dysfunction in sepsis is obvious. However, clinical and experimental data on cerebral perfusion in sepsis are often inconsistent and most reports only include small numbers of animals or patients. We summarize the current literature on the effects of the inflammatory response on cerebral perfusion and review the effects of altered cerebral perfusion on brain function in sepsis. In sepsis, the brain may be affected by many systemic disturbances, such as hypotension, hypoxemia, hyperglycemia, hypoglycemia, and organ dysfunction (e.g., increased levels of ammonia in liver dysfunction or urea in acute kidney injury). Direct brain pathologies, such as ischemic brain lesions, cerebral micro- and macro-hemorrhage, microthrombi, microabscesses, and multifocal necrotizing leukencephalopathy, have also been described in histopathologic examinations [4, 5]. However, in addition to these metabolic and 'mechanical' effects on the brain, inflammation by itself causes profound alterations in cerebral homeostasis in sepsis. Sepsis at the outset causes a hyperinflammatory reaction, followed by a counteractive anti-inflammatory reaction. Pro- and anti-inflammatory cytokines are initially up-regulated. Despite its anatomical sequestration from the immune system by the blood-brain barrier, the lack of a lymphatic system, and a low expression of histocompatibility complex antigens, the brain is not isolated from the inflammatory processes occurring elsewhere in the body. The circumventricular organs lack a blood-brain barrier, and through these specific brain regions blood-borne cytokines enter the brain [5, 6]. The circumventricular organs are composed of specialized tissue and are located in the midline ventricular system. They consist of the organum vas culosum, the pineal body, the subcommissural organ, and the subfornical organ. They also express components of the immune system (Toll-like receptors [TLR]), and receptors for cytokines such as interleukin-1β(IL-1β), interleukin-6 (IL-6), and tumor necrosis factor-α (TNF-α). A further mechanism by which the brain can detect systemic inflammation is through afferent vagal fibers ending in the nucleus tractus solitarius, which senses visceral inflammation through its axonal cytokine receptors. In response to the detection of systemic inflammation, behavioral, neuroendocrine, and autonomic responses are generated including expression of immune receptors and cytokines, inducible nitric oxide synthase (iNOS), and prostaglandins leading to oxidative stress, mitochondrial dysfunction, and apoptosis [5, 7, 8]. The blood-brain barrier, established by the tight junctions of the endothelial cells in interaction with astrocytic foot processes and pericytes, is responsible for a tightly regulated microenvironment in the brain. It prevents circulating noxious substances from entering into the brain and regulates brain capillary blood flow . In sepsis, cerebral endothelial cells are activated by lipopolysaccharide (LPS) and pro-inflammatory cytokines, including bradykinin, IL-1β, and TNF-α; TNF-α also activates iNOS . These changes in the cerebral microcirculation are associated with the upregulation of mRNA for local production of IL-1β, TNF-α, IL-6, and NO by induction of iNOS. Furthermore, leukocytes stick to the wall of blood vessels and enter the brain, mediated by adhesion molecules. The expression of one such adhesion molecule, the intercellular adhesion molecule (ICAM), is increased in septic rats . These local factors can promote endothelial dysfunction and result in blood-brain barrier breakdown leading to an increased permeability of the blood-brain barrier and to perivascular edema, as has been demonstrated in several animal models of sepsis [11–13]. The former facilitates the passage of neurotoxic factors, while the latter impairs the passage of oxygen, nutrients, and metabolites. The increased diapedesis of leukocytes and the perivascular edema decrease microcirculatory blood flow in the brain capillaries. Further evidence for an alteration in the blood-brain barrier comes from work by Alexander and colleagues . In an animal model, these authors demonstrated that endotoxemia-triggered inflammation in the brain led to an alteration in the blood-brain barrier, including an upregulation of aquaporin 4 and associated brain edema. This sequence of events appeared to be mediated by TNF-α signaling through the TNF receptor 1 . In a recent magnetic resonance imaging (MRI) study in nine humans with septic shock and brain dysfunction, sepsis-induced lesions could be documented in the white matter suggesting blood-brain barrier breakdown . However, in a pathologic study no evidence of cerebral edema was reported in 23 patients who died of septic shock . NO is produced by the endothelium and plays an important role in the regulation of vascular tone; its increased release may be responsible for the vasodilatation and hypotension in sepsis . iNOS is activated by endotoxins and cytokines leading to local and general vasodilatation [8, 17, 18]. NO is also considered a potent cerebral vasodilator . Thus, NO may play an important role, not only in mediating systemic vascular resistance, hypotension, and cardiac depression, but also in cerebral vasodilatation during sepsis. However, in an ovine model of hypotensive-hyperdynamic sepsis, Booke and colleagues  demonstrated that inhibition of NOS did not alter cerebral blood flow (CBF) and postulated that CBF is regulated by mechanisms other than NO during sepsis. Nonetheless, in situations of ischemia and reperfusion the presence of great amounts of NO can cause an increased production of reactive oxygen species (ROS), like peroxynitrite, responsible for the destruction of membranes in cells and mitochondria. Finally, another mechanism by which the brain is affected in sepsis is the generation of ROS by activated leukocytes. Exposed to these radicals, erythrocyte cell membranes become less deformable and may be unable to enter the brain microcirculation, thus aggravating the cerebral hypoperfusion seen in sepsis [21, 22]. The brain itself with its high oxygen consumption and low antioxidant defense is susceptible to damage by ROS. Generation of ROS may alter oxidative phosphorylation and cytochrome activity in the mitochondria and impair cerebral energy production. Mean arterial pressure (MAP) is notoriously low in severe sepsis and septic shock. Accordingly, cerebral perfusion pressure (CPP) is low. Moreover, in view of the possible presence of brain edema, the influence of intracranial pressure (ICP) on CPP must be considered. Pfister et al. measured ICP non-invasively in 16 patients with sepsis and reported moderate elevations of ICP > 15 mmHg in 47% of patients; an increase > 20 mmHg was not observed. CPP < 50 mmHg was found in 20% of their patients. Assuming that cerebrovascular pressure autoregulation is intact and the plateau of the autoregulatory curve is not shifted, their results suggest that CPP in the majority of the patients they investigated was likely to remain in the lower range of the autoregulatory plateau. However, this interpretation is partially in contrast to measurements of CBF in patients with sepsis. Bowton et al. demonstrated that CBF was reduced in patients with sepsis independent from changes in blood pressure or cardiac output. These authors used the 133Xe clearance technique to measure CBF in nine septic patients. Similarly, Maekawa et al. found significantly lower CBF in six patients with sepsis-associated delirium than in awake controls. In an experimental model of human endotoxemia, Moller and colleagues  reported a reduction in CBF after an intra venous bolus of endotoxin in healthy volunteers. However, the authors assumed that CO2 reactivity was intact in their subjects and explained this CBF reduction to hypocapnia occurring because of general symptoms of malaise, although they did not measure CO2 reactivity in their subjects. Using transcranial Doppler (TCD) and arterial partial pressure of CO2 (PaCO2) levels between 3.0 and 7.0 kPa, Matta and Stow  found relative CO2-reactivity to be within normal limits in ten patients with sepsis. Their patients were in the early stages of sepsis (< 24 h after admission to ICU), were all mechanically ventilated, and received infusions of midazolam and fentanyl. Absolute CO2-reactivity was lower than had been reported in subjects who were awake but consistent with values obtained during sedation and anesthesia. Similarly, Thees and colleagues  reported a normal response to a decrease in PaCO2 in ten patients with sepsis using TCD and cardiac output measurement by thermal dilution. Their patients were all mechanically ventilated, and sepsis had been established for > 48 h. Bowton and colleagues  also reported normal specific reactivity of the cerebral vasculature to changes in CO2 in nine septic patients. However, Terborg and colleagues  reported impaired CO2-reactivity in septic patients, independent of changes in MAP. They used TCD and near-infrared spectroscopy (NIRS) to assess CO2-induced vasomotor reactivity by inducing hypercapnia through reductions in the ventilatory minute volume in eight mechanically ventilated septic patients. It is important to note that all their patients suffered from a neurological or neurosurgical illness, which may have affected the results. Similarly, Bowie and colleagues  observed significantly impaired cerebral CO2-reactivity in septic patients in a study of 12 sedated and ventilated patients who had sepsis for > 24 h using TCD at normocapnia, hypocapnia, and hypercapnia. The small sample sizes, differences in timing of the measurements of CO2-reactivity and in the severity of illness between groups, which is reflected by the significant differences in mortality as well as in some of the drugs used in the management of these patients, may be responsible for the conflicting findings. Only a few studies have addressed the effects of sepsis on cerebral autoregulation. Matta and Stow  reported intact pressure autoregulation in ten mechanically ventilated patients with sepsis (not in septic shock) using a phenylephrine infusion to increase MAP by 20 mmHg and calculated an index of autoregulation by dividing the percentage change in estimated cerebral vascular resistance by the percentage change in MAP. Conversely, Smith and colleagues  reported loss of cerebrovascular autoregulation in 15 patients with septic shock as they were able to demonstrate a correlation between cardiac index and CBF using TCD and cardiac output measured by thermodilution. In a recent study, Pfister and colleagues [30, 31] found disturbed cerebral autoregulation in patients with sepsis-associated delirium - but not in patients with 'plain' sepsis - using TCD and NIRS. This suggests that cerebral autoregulation is possibly intact in patients with sepsis but disturbed with more severe disease or complications manifesting as septic shock or sepsis-associated delirium. Cerebral ischemia is a reality in sepsis: In a post-mortem analysis of the brain of patients who died from sepsis, multiple small ischemic lesions could be identified in different areas of the brain . Possible explanations are the hypotension seen in sepsis, especially when con-current with preexisting cerebrovascular disease or autoregulatory failure. Thrombotic mechanisms due to a high hematocrit and increased viscosity of blood in sepsis may lead to watershed infarction as has been described in a septic patient with prolonged hypotension . Sepsis-associated delirium is a common organ dysfunction in sepsis and may actually occur before failure of other organs. It can be found in up to 70% of patients with the sepsis syndrome and is correlated with the severity of sepsis [32–34]. Depending on the criteria used for diagnosis, it may be detected in almost all patients with sepsis [32, 35]. Sepsis-associated delirium has been reported as an independent predictor of death ; however it may only reflect the severity of illness and may not be the cause of death itself. Sepsis-associated delirium presents as an alteration of the mental state and may range from lethargy or mild disorientation to obtundation and coma. The pathophysiology of sepsis-associated delirium is incompletely understood and is probably multifactorial. Mechanisms postulated to cause sepsis-associated delirium include brain activation by inflammatory mediators via the vagus nerve and the circumventricular organs, which interfere with the liberation of neurotransmitters and neurohormones. Oxidative stress and formation of ROS compromising cell function and endothelial activation resulting in disruption of the blood-brain-barrier are other mechanisms proposed to play a role in development of sepsis-associated delirium . However, cerebrovascular autoregulation may also play a role in sepsis-associated delirium [25, 27, 29, 30, 36]. Pfister and colleagues  reported less efficient autoregulation in patients with sepsis-associated delirium compared to patients without sepsis-associated delirium. However, in the same patients, cerebral oxygenation measured by NIRS did not differ between patients with and without sepsis-associated delirium. Thus, reduced cerebral blood flow and disturbed cerebrovascular autoregulation may - among others - be important precipitating factors for sepsis-associated delirium [2, 30]. Alternatively, it could also be argued that disturbed autoregulation is merely a reflection of a more severe inflammatory stimulus that is associated with a more profound dysfunction of the blood-brain barrier and hence endothelial/autoregulatory dysfunction. Data on the cerebrovascular effects of catecholamines in sepsis are scarce. The blood-brain barrier prevents catecholamines from entering the brain as long as it is intact. Cerebral hemodynamics are not directly affected by norepinephrine and phenylephrine in anesthetized patients without cerebral pathology . After head injury however, dopamine, norepinephrine and phenylephrine all seem to increase CBF with the effect of norepinephrine being more predictable than that of dopamine . This is possibly due to the fact that in head injury there is also a disruption of the blood-brain barrier that allows, e.g., norepinephrine to access intra-cerebral β receptors leading to an increase in cerebral metabolism and, hence, CBF . Accordingly, it could be speculated that in sepsis also the cerebral effects of vasopressors may be unpredictable depending on the degree of blood-brain barrier dysfunction. A representation of documented and hypothetical factors influencing cerebral perfusion in sepsis is shown in Figure 1. 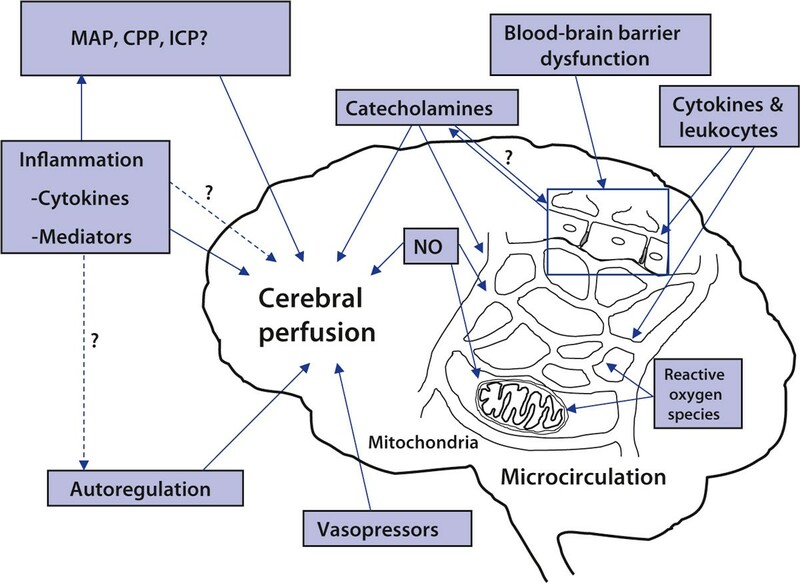 Synopsis of documented and hypothetical factors influencing cerebral perfusion in sepsis. Some of the factors (e.g., nitric oxide [NO]) influence cerebral perfusion at different levels of the brain circulation. It could be speculated that the effect of vasopressors may be unpredictable depending on the degree of blood-brain barrier dysfunction. MAP: mean arterial pressure; CPP: cerebral perfusion pressure; ICP: intracranial pressure. The inflammatory response observed in sepsis triggers profound changes in the brain. Blood-brain barrier permeability is increased, and substantial changes in regulation of CBF and cerebral perfusion may occur. Hypoperfusion due to severe hemodynamic instability will obviously lead to ischemic brain injury. Furthermore, the changes in pressure autoregulation may result in an increased vulnerability of the brain to hypoperfusion. However, this does not explain the full range of brain dysfunction found in septic patients. So far it has not been possible to establish a clear link between cerebral perfusion and sepsis-associated delirium. It is conceivable that the effects of the inflammatory response on the brain per se are the key events leading to sepsis-associated delirium, and that the observed changes in CBF regulation are rather a consequence of inflammation than a cause of sepsis-associated delirium. We would like to thank Allison Dwileski, BS for her expert assistance in the preparation of this manuscript. This article is published under license to BioMed Central Ltd. This work is subject to copyright. All rights are reserved, whether the whole or part of the material is concerned, specifically the rights of translation, reprinting, reuse of illustrations, recitation, broadcasting, reproduction on microfilm or in any other way, and storage in data banks. Duplication of this publication or parts thereof is permitted only under the provisions of the German Copyright Law of September 9, 1965, in its current version, and permission for use must always be obtained from Springer-Verlag. Violations are liable for prosecution under the German Copyright Law.